Read the 2016 State of Transit report here. We have made undeniable progress : The recent 2015 and 2016 service enhancements a needed step in the right direction. In April 2016, the New Orleans Regional Transit Authority (RTA) added about 11% additional vehicle revenue hours (VRH – the time that a transit vehicle is actively serving paying customers) with a focus on expanding later evening and early morning trips. Overnight transit service was added on eight lines, raising the total of lines providing 24-hour service to nine. Early morning service was added to 15 lines. Additional weekend service was added, increasing the total amount of weekend service by 28 percent. But we are still falling short: We are not providing reliable access to jobs and other opportunities for the New Orleans residents who need it the most. The average New Orleanian with a car can reach 89 percent of the region’s jobs in 30 minutes or less. But the average New Orleanian relying on transit can only reach 11 percent of those jobs in the same time period. In a poor city with rising inequality this is unacceptable if we want to provide better access to opportunity. We can do better – To address this Ride urges the City of New Orleans and the RTA to commit to achieve 1,000,000 vehicle revenue hours by the end of 2020. In 2015 we were at 672,974 and the RTA estimates we are at 750,000 after the April service enhancements. That means this goal is very possible to reach. We would need to increase our vehicle revenue hours by approximately 8 percent each year from 2017-2020. We have been averaging at least this pace over the last several years. We’re making progress – The RTA has restored bus routes that were cut following Katrina and added frequency throughout the system, all while steering the agency to financial stability, successfully negotiating for cost savings, service improvements in their new contract with operator and manager TransDev. At the same time, the City of New Orleans’ leaders have created a favorable policy climate that values integrated land use, workforce, and transportation policies, opening the door for the RTA and the City to advance improvements to our public transit service and infrastructure. But we still have a ways to go – Ten years after Katrina, New Orleans’ transit recovery remains uneven. Bus service remains down 65% while there are now more streetcars lines offering more trips than in 2005. While streetcars remain an historic and iconic part of our transit system, they are costly to install and inflexible in providing service. Federal monies and local bond sales have financed a massive streetcar expansion project which has not been well-integrated into the existing network of bus routes and has actually worsened commutes for some bus riders by forcing them to transfer to the new streetcar to complete their trip. A way forward – The recovery has been uneven, because it has been the result of a series of ad-hoc decisions. The agency still lacks an integrated vision, guided by community priorities. It is missing a framework with which to evaluate and weigh investment outcomes among competing interests for limited resources. The RTA should act immediately to develop a truly comprehensive transit master plan, together with their many stakeholders. With the City preparing to embark on an update of the Master Plan, RTA and City leaders must work collaboratively to ensure that transit service seamlessly supports anticipated developments and growth while connecting people to economic opportunity throughout New Orleans and the surrounding region. RIDE New Orleans’ analysis in this report highlights several critical findings. 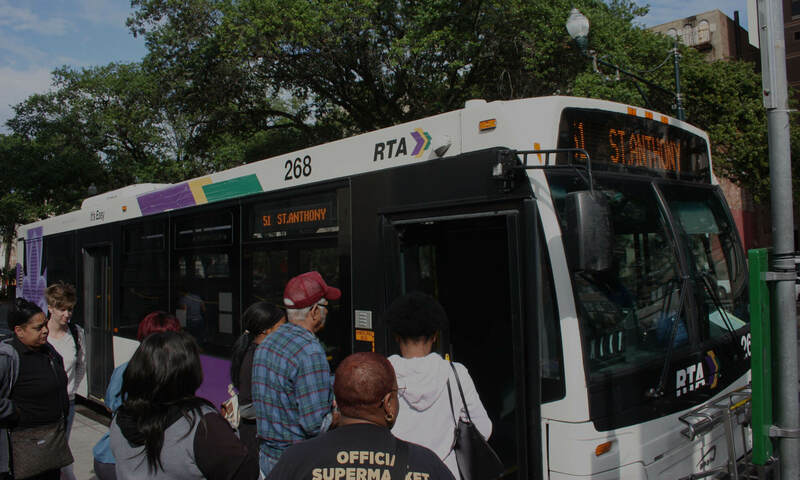 First, our research confirms that, by the end of 2012, just 36% of the pre-Katrina transit service offered by the RTA in 2005 had been restored – although 86% of New Orleans’ population had returned to the city. Second, our analysis shows that these service reductions have been worst in areas where transit service is needed most: low-income neighborhoods, communities of color, and areas where people have less access to personal vehicles. Third, our analysis of the RTA’s finances shows that the agency is operating at a significant deficit every year and will soon run out of cash reserve funds. Some of the basic causes of the deficit are clear: our transit system costs more to operate than comparable systems and it charges lower fares. Yet, to date, the conversation about correcting the deficit has centered only on a potential fare increase. The findings in this report indicate that any sustainable solution to the deficit will need to involve lowering the costs of service as well as increasing revenues of all types.